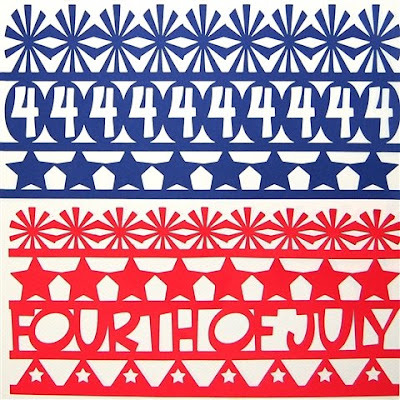 Capadia Designs: Happy Fourth of July! It is the first of July and it was chilly, cold and rainy here in New England today. We are starting to wonder if there will be a "real" summer this year! But the Fourth of July is nearly here, so I thought about a design I made quite a while ago (before there was a "Stand and Salute" cartridge). 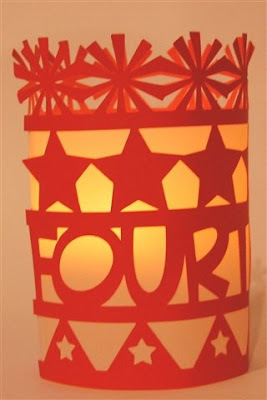 Last October, after I made the Halloween lanterns which were featured in the Chirp newsletter on the Circut.com site, I was asked to design something similar for the Fourth of July. If you don't remember or didn't see these lanterns this LINK will take you to all of the Halloween entries - there is a ghostly fence border and then three entries about the Halloween design (you might want to start reading with the oldest post first). This is the mesh I designed for that lantern. It was meant to be cut on the Expression and I used Plantin Schoolbook, Accent Essentials, Cuttin Up and Celebrations. Here is a LINK to the original post - I have moved the file to 4shared if you want to download the large version. 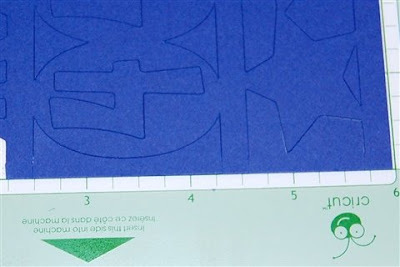 You need the Expression and a 12 x 24 mat to cut the original design. I decided to adapt this design to make shorter lanterns and to make it "baby bug compatible." I needed to change cartridges and adapt the sizing and placement to fit a baby bug mat. I changed from Plantin Schoolbook to George for the long rectangles between the rows of elements and I eliminated the Accent Essentials starburst since it is less likely that a baby bug owner will have this cartridge. The bars extend into the "uncuttable area" at the sides of the mat but you can simply make a few snips with some sharp scissors to complete the cuts. 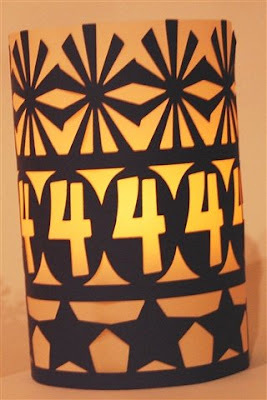 Don't forget to save any useful bits leftover - these "4s" could be used on another project. I used Creative Memories Precision Point adhesive on the back of the cuts and when it had dried to clear I adhered vellum along the cut. I used Scor-Tape to hold the sides of the lantern cylinders together. For one version of the lantern I adhered the vellum up to the last bar and left the top elements open with no lining. For the other version, I adhered vellum all the way to the top of the design. 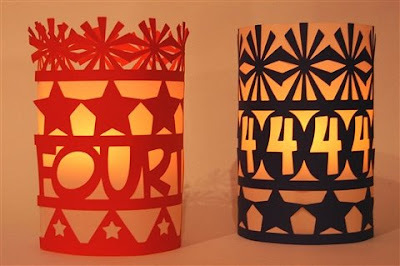 It really is a matter of personal preference (and may depend on how much vellum you have handy - I had a 10 x 12 sheet which I could cut in two pieces to complete both lanterns by making them slightly different in the amount of backing. I actually think I prefer the look of the open top. 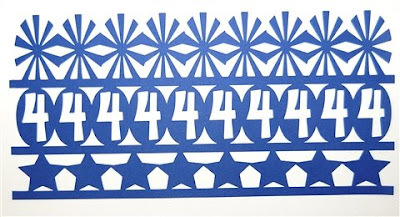 These cuts can also be used as a wide border on a scrapbook page or for a holiday display. 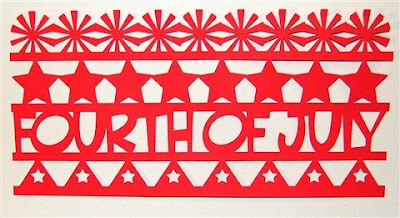 The stars along the bottom of the red cut are optional and are on a separate page of the file. 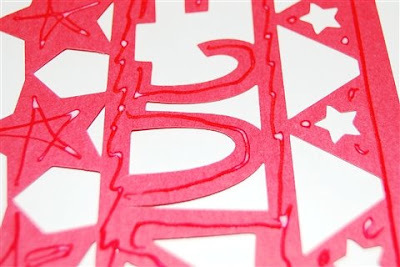 If you want to use them, cut the first page and just leave your mat in the machine and cut the star page. If you don't have Cuttin Up, it is easy to change the letters to a font that you do have (but Cuttin Up is a great font and you should have it!). Here is a LINK to a post where I explained how to change the letters on the Halloween Design - if you have any problems, just let me know. I used a battery operated small pillar candle to light the lanterns. If you use a real candle, be sure to put it in a glass container and then place that container in the lantern. You have to be really careful with these paper cuts and an open flame! 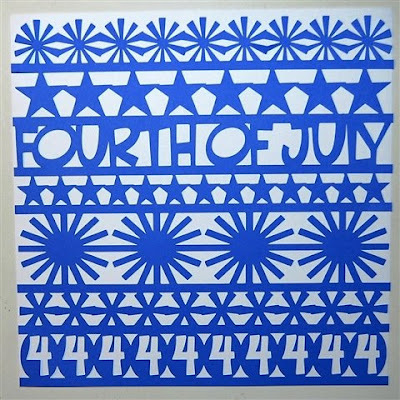 I will probably use these as table decorations on Saturday when we celebrate the 4th - I just wanted to post them today to give you time to make them if you would like to use them this weekend. Beautiful! what else can I say but Thanks as always for sharing! Diane! This is really phenomenally gorgeous! I LOVE IT! So clever! I love the beautiful things you make in Design Studio! You've got so much talent! Thank you for sharing another fabulous project! I've left you an award on my blog. Thank you for sharing your talents with us so generously. 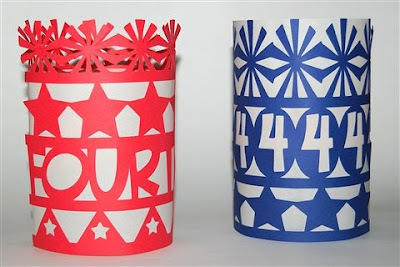 I can't wait to make a 4th of July lantern. Thanks for the awesome ideas. You rock the DS! Beautiful! Where do you get your 12x24 mat? Is it only usable with design studio? You can usually get 12 x 24 mats at craft stores (Michael's, Joann's, ACMoore) or order them online. These mats are only for the Expression. If you want to use Design Studio to cut a true 12 inch border or the full width of a 12 inch page you can position the paper at the one inch mark to avoid the "uncuttable" area. You can also use the 12 x 24 mat with the machine freestanding.